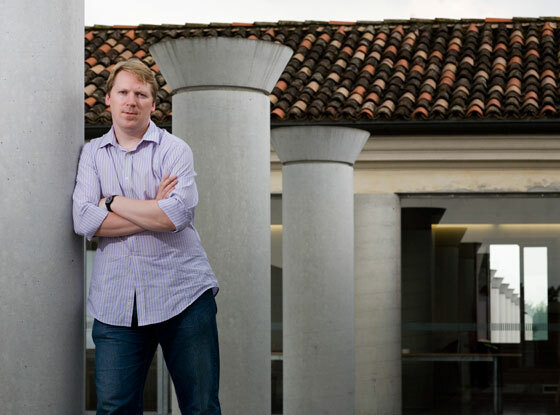 Fabrica interviewed the co-founder of Architecture for Humanity and Open Architecture Network. During Sinclair’s workshop at Fabrica, held from July 14 to 17, 2008 and entitled “The Beautiful Game - Social Change Through the Power of Football”, the architect gave a wide range interview on major social topics such as culture, environment and economics. Cameron Sinclair is the co-founder and ‘eternal optimist’ for Architecture for Humanity, a charitable organization founded to develop architectural and design solutions to humanitarian crises and provide pro-bono design services to communities in need. Currently the organization is working in fourteen countries on projects ranging from school, health clinics, affordable housing and long term sustainable reconstruction. Trained as an architect at the University of Westminster and the The Bartlett School of Architecture, University College London, Sinclair developed an interest in social, cultural and humanitarian design. After his studies, he moved to New York where he worked as a designer and project architect. Sinclair and Architecture for Humanity co-founder Kate Stohr have compiled a compendium on socially conscious design titled “Design Like You Give A Damn: Architectural Responses to Humanitarian Crises” (May 2006, Metropolis Books). In 2004 Fortune Magazine named Cameron Sinclair one of the Aspen Seven, seven people changing the world for the better. He was the recipient of the 2006 TED prize and the 2005 RISD/Target Emerging Designer of the Year. Recently he was selected as a 2008 Young Global Leader by the World Economic Forum and named as one of the 2008 Principal Voices for CNN. As a result of the TED Prize he and Stohr launched the Open Architecture Network, the world’s first open source community dedicated to improving living conditions through innovative and sustainable design. How do you see the future of food? Will there be enough food for everyone? I think as food becomes more scarce, what we class as luxury food will be no more. That’s the extinction of things that we class as a luxury and maybe we will begin to realise the value of simplicity in food. What relationship will we have with natural resources in the future? The challenge we have is that if we are going to commit to living in a world with harmony in energy production, we are actually going to cause a lot of pressure on land use. So if we go all solar we don’t have the feasible land to deal with the number of arrays we need for growing populations. If we only rely on wind we don’t have land for the number of wind farms, if we go nuclear then we have the dangers of who gets nuclear how… and that is creating inequality in natural resources, if we say one country can have nuclear power but the other one cannot because we are scared of what they will do with it. So in a way if we are going to use renewable energy we have to do it on a global equity standards, not just for the few. If we slow down, will we live better? I think there are always going to be people in life that move at a very fast speed, it all depends on how productive we become. If you are moving very fast and you are not being very productive then you are a massive consumer of the environment and of energy. But if you’re focused and you take life slower and you can be more productive, then holistically you are actually much more in harmony with the environment. You can’t help people to slow down. You just have to hope that they are more productive. What kind of transportation do you see for the future? Which kind of transformations will we have in terms of mobility? We are either going to have to produce vehicles using purely green technologies that are renewable and affordable, or we are going to have to introduce older forms of technology that are cost prohibitive. If the price of oil is 300 dollars a barrel maybe we can start using air ships again or we can start using more animal powered vehicles as opposed to motor vehicle. How will our relation with water change? Personally I’m concerned about water because most people are trying to create equality so everyone has access but with the rapid change in the climate, the scarcity of water will become so great that it will actually create political instability. Therefore the future wars will not be for oil but access to water and so we will see conflicts arising out of water in the future. I think we are going to have to use water again and again, not a one-time use. We are going to have to find the way to re-filter and reuse water again or find new way for extracting water from the sea and using it for consumption in a way that’s affordable and cheap and so forth, otherwise we are going to end up in conflict. You have worked a lot in Africa; in what way do you think that people in Africa consider water precious? I think there’s a real challenge right now. Certainly in Africa water has always been precious because if you don’t have access to water then you can’t grow crops. As Africa is an agricultural continent it has the pressures of people moving to the city causing more need for water in urban environment. That’s driving the water away from the rural community so therefore less farmers are producing, forcing them to come to the city. This lack of access to water is actually forcing this urban issue and they are compounding each other. I think we need to focus globally (not just in Africa) or how we can create more profit and more incentive to support rural substance and rural development and not just responding to the urban condition. Will globalization be a topic for tomorrow? For my generation globalization is a part of life, it’s nothing new. We have always lived with globalization. I think the future is a return to localization. How can we live within a community in a global context rather than outsourcing here and outsourcing there and in-sourcing certain jobs and the idea the economy is these kind of hubs? Certain cities are the hubs of resources, the hubs of finance, the hubs of creativity. How can we come back and create local hubs based on financial supports, security and so forth? Which economical trends will we witness? coming from the east and not from the west. After the American dominance, now we see China’s power rising. Will Africa be next? No, I think the next decade will be defined by India. It will continue to be defined by China but not just in the positive, not just in increased production but also into the negative. The idea is mass populations will create this divide between rich and poor. As India becomes much stronger powerhouse it also will leave behind more and more people creating political instability. There may be more conflicts internally in India even though it maybe will be one of the strongest nations on the planet. What might be interesting in the future is different regions of the world begin to realign; so instead of just the European union maybe there will be a Polynesian union, Austria-Asian union, maybe there will be a Sub-Saharan union, the African nations will come together as one super power rather than many many countries. What kind of migration can we predict? We’ve lived in a world so far where the developed countries have always assumed that people are migrating to them. Italy’s growth is only because of migration but as cost of living escalates and opportunity dwindles, people are going to begin to move elsewhere. They are already moving to middle east, they’re already moving to Africa. There will maybe be a reverse migration over the next hundred years to places where there are better opportunities for increasing life style. What will the meaning of money be in the future? We may not have money in the future. Right now Brazil and Japan have a billion dollar economy where people don’t exchange money, it’s all done through bartering and so forth. And I think the hidden economy will strengthen as monetary values fluctuate too much. The value is going to be on the task not on the cost. Money may become worthless in the future. Which role will corporations play in the future? What do you think about growth? Can we continue to grow, as we are presently? I think we are in dangerous growth right now. We are not growing smartly. It’s chaotic: the places that are growing rapidly are the places that also can’t deal with this rapid growth. In lot of the major cities around the world many many people are migrating causing great pressure. Whereas cities in North America or in Europe are dying. As much as there is growth in one place there’s death in another. The world is shifting in power and balance. I don’t think it’s being done smartly; we are not designing for smooth growth. We are designing for shrinking, we are designing for massive growth and it’s very unstable. What is the role of art in the future? We have reached the pinnacle of technology; we can do anything we want in the world using technology. We have found ways to break through science, physics, math, through the power of technology. I think art will become the new technology because now the question is not “can we do it?”, it’s “how do we do it?”. In a way, art breeds creativity and creativity breeds innovation and bringing the concept of art into technology, is where the future lies. Does this mean that technology will inspire art or that art will influence technology? I think it’s back and forth. I think technology influences the production of art on a reactive level, but proactively I think art and creativity can influence technology. The way we use technology, the way we listen to music, the way that performances are made will be done in a proactive creative way. So in the future we may not have I-pods, we may not go to opera houses. There will be a new form of communicating music, there may be a new form of viewing art and it’s not because of technology but technology is a tool to make it happen. In the world of tomorrow will there be more designers or better designers then now? I think in the future, design in order to improve must incorporate leadership. If design wants to do good, if design wants to change culture, to change society, the designer him or her self must be a leader. Maybe one day we will have a president or a prime minister who is a designer, who thinks creatively, who thinks about problem solving in a way a designer does. But until we get to that day, I think the forces of the status quo will never allow that to be a massive change so we need to almost become the leaders in order to allow that change to happen. What role will mass media play tomorrow? My concern is we’re living in a generation of consumer produced media. We live in the world of YouTube and the idea of musicians who work out of their basement, shows that everybody can be creative. The large media companies realise that not only is this a big threat, but also a big opportunity, so maybe mass media will be communicated on what seems like individual bases but actually these people are working, or being hired by large corporations. So rather than one newspaper telling you a story maybe there’s hundreds of different people explaining the story in different ways, in order to change views, to change minds. Through technology, through the web, the idea is that rather than having one reporter, (this tradition of one anchor and one voice that represents the truth), maybe mass media will use the voices of many to convince. The idea of crowd sourcing of media and of information. Yes. Not only in reporting but also in investigating. Everybody will be investigating the truth and reporting on the truth and in response you have to try and evaluate which one of these stories is the truth. Is there still place for morality? Yes. I think there will always be morals; there will always be humanity. I think people will always do the right thing because that’s what makes them human. What will our relation with death be? We will always know it’s coming. Through the history of time death has always been the final stop. And I think we will continue to think about it that way. That we have a finite time on the planet and our achievements are always going to stop the moment we die. There will always be death. Maybe we will live in a life in the future where you spend forty years learning, studying, you spend forty years working then you spend another forty years relaxing and understanding and retiring so maybe our life will be in thirds. What do you think about the home of the future? What kind of transformations will we see regarding such an important environment? The home of the future will change through technology in the western world, in the developed world. I think houses will think, react and sense when somebody is home; you won’t be turning on the light switch or plugging in an appliance. The home will know that there are people in the house; they’ll understand through routine what people will do. So you wake up in the morning, the house will sense that somebody is awake, so it makes the coffee, so you go downstairs and breakfast is already made and it’s much more efficient. But I think that is only for such a small portion of the world. For most of the world people will be living in homes that are very simplified and have access to water, have access to energy but all of this will be renewable so we’re no longer going to rely on utility companies. I think we need to think more about research in development of housing for the ninety percent who live in simple homes and not for the ten percent who live in the advanced technology driven homes. What about cities in the future? The city will always be chaos. The world’s cities are like humanity at its rawest. They are chaotic, beautiful, energetic, overwhelming and in the future cities will grow in such a grand scale that all of this will be amplified. I think internally we are going to have to understand how we will live in chaos and how to find the beauty in the chaos. This is how cities will be in the future. Will our relations with animals change? I’m not as optimistic. I think we will go through a period where a lot of animals will become extinct, we will no longer have many of the animals we saw in the children’s books. In a way it will make us a little more aware of our impact on wildlife. Only when we lose the things we love do we protect them. I think we will lose polar bears, we will lose tigers, we may lose elephants, we may lose these icons of the planet that we cherish. Only then we will collectively say: “okay, enough is enough” but I think until this loss there will never be the right protection. What will happen to consumers? I think the consumer will become passionate. When they buy a product, they will not just think about what the product will do for them but what the product did for the people who made the product and also what the product will do for the planet. So in a way, the object that you buy has a life not only now but before and afterwards. We will buy products based on how much in harmony that product is with the planet and how it might create jobs and how it might empower people. Will we need to be educated on what to buy and how to buy? I think that in the future people will be concerned about the products and will demand products that care about the environment, demand products that are energy efficient. Instead of waiting for a designer to come up with the solution, they will work collectively to force the company to produce the quality of product. They will vote on the qualities they want in the product and because you have a large number of people, it would mean that the company could make instant profits if they do the right thing. So in a way, the community is a whole that demands the right thing and then the producer will produce the product based on the number of people. Rather then producing ten thousand types of toothbrushes and hoping that somebody will get the right toothbrush. How will politics have to change? I think that each government has to understand its own democracy, its own way of working and not look at others with envy and copy. When you copy a solution it never turns out correctly. I think for instance in Italy the way politics is run has to be Italian, in Spain, Spanish, in Saudi-Arabia, Arabian. You can’t just create a way of government working and sell it like Big Mac’s to everybody and say: “if you copy us, you’ll have a lot of success”. I think governments need to develop locally, I think they need to be open and transparent to stop corruption. I think there needs to be a mechanism that can switch out the government much quicker rather then waiting four years before things have gone wrong. You know, in the United States right now less then ten percent believe in the government. So that means 90 percent are upset, why should they wait two more years to get a new government? If most of the people in the country are in disagreement, we should be able to switch or find new ways for it to evolve. There’s no accountability. When there’s accountability people will do the right thing. What do you think about human rights? I think human rights will evolve. I think people will begin to say that its not just about equality between religion, equality between ethnic groups, equality between countries but equality and equal standards of access to education, access to health care, access to decent housing. The basic amenities of life will become human rights and not just protocols of the United Nations. Then we will equally say: “everybody has the right to basic shelter, everybody has the right to water” and these will become aspects of human rights. Is there still place for the family? And is family still an important value? There will always be family. It’s the nature of the human race. When two people meet, they eventually have children, they love those children…that unit always will exist. Life is hard, it’s hard to keep together and you have to work and struggle for it, but there’s a beauty in the family. From the history of time we have always worked in packs, we’ve always worked in small units together and I think there will always be a role for the family. It may not look like the family of the 19thcentury, may not look like the family of the 20th century but it still will be a family. Maybe it will not be through the institutions that we used in the past, but there will always be family. Will sexuality change in the future? We always debate about sexuality asking “is there a change?”. But we always focus on a small minority that is at the boundaries, which is at the peripheries, in the extreme and we talk about it as if it’s the norm. Yes there will always be people that are exploring new opportunities and new ways of sexuality. It’s human nature, it’s evolution. But the majority of the people is the same. Men will always be with women. It’s biology. There always will be variations on the boundaries. By limiting those and putting a stop and saying “this is the absolute” you actually cause more problems than saying “we should be the full spectrum”. There will always be people experimenting on the edges but the edges will never become the norm. Do you think that in the future everyone will be able to have a safe home? I think that right now there are many designers focused on the needs of communities who don’t have access to decent and adequate housing. It’s very important to us to create dignified structures for everyone. But as much as my focus is on poorer communities, people who are affected after disasters, in a funny sort of way the richer and the more wealthy families are creating fortresses that are enclosing them. I always find it funny when I speak to somebody who’s extremely well off, that they never seem happy. And they are never happy because they are constantly trying to shut themselves off from the things they fear and are scared of. As much as we need to create homes and a joyful place for those who are less fortunate, in a funny sort of way we need to create more joyful spaces for those who are well off. It’s both spectrums of society that need good housing.